Conophytum minimum 'wittebergense' RR714, Klipfontein. Origin and Habitat: Witteberg Mts., Western Cape, South Africa. Altitude: 800 - 1100 metres above sea level. Description: Conophytum wittebergense is one of the innumerable ecotypes of the very variable Conophytum minimum. It is an outstanding species with tiny bodies marked with a network of dark red dots and lines on top. It show an incredible complexity of patterns and growers have indulged in unnatural selection and the best-marked forms are highly prized. Some of those are well-decorated with fantastic red lines and other are almost black, due to the lines becoming a solid mass. The small white flowers are nocturnal and highly scented. It is extremely decorative even without flowers. Habit: It is a minuscule winter-growing, almost stemless, perennial leaf-succulent up to 3 cm tall and forms dense mats or cushions with time. Bodies (paired leaves): Variable, small, tiny, less than 1 cm in diameter with a small growing cleft that doesn't reach right across the body. Colours: Silvery-green, variously spotted with dark brownish-red or purple dots and lines which turn a beautiful bright red-black colouration during the resting period. Flowers: Abundant nocturnal, small, whitish, strongly scented. The thin petals are white, pale yellow or slightly and form an almost star-like, spidery structure and very showy. Blooming season: Blooms mostly in autumn (in cultivation in Europe August-November). Notes: It is closely related to its neighbouring species Conophytum joubertii, Conophytum ficiforme, Conophytum piluliforme, and to the widespread Conophytum truncatum. 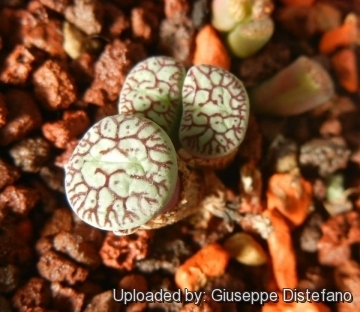 Conophytum labyrintheum (N.E.Br.) N.E.Br. : has the bodies 6-8 mm in diameter with the upper surface more or less flat, and the flowers to 8 mm in diameter. Conophytum minimum (Haw.) N.E.Br. : tiny bodies marked with few to many reddish dots and lines and scented nocturnal flowers. It is very variable. Distribution: Western Cape. Conophytum praecinctum N.E.Br. : has the bodies 6-8 mm in diameter with the upper surface vaulted and the flowers more than 8 mm in diameter. Conophytum vagum N.E.Br. : has the bodies 9-15 mm in diameter. 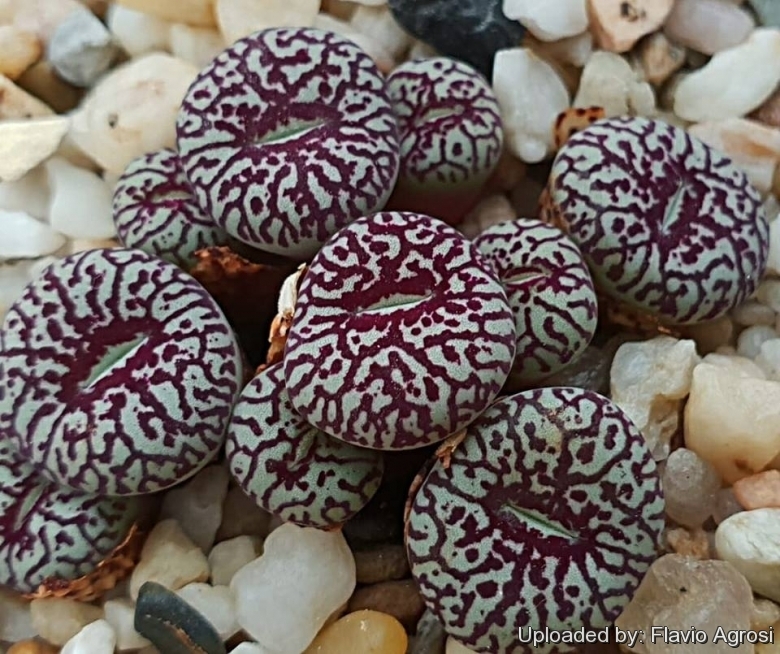 Conophytum wittebergense de Boer: has tiny bodies marked with a network of dark red dots and lines on top. Some of those are well-decorated with fantastic red lines. Distribution: Witteberg Mts., Western Cape. 8) Wikipedia contributors. "Conophytum minimum." Wikipedia, The Free Encyclopedia. Wikipedia, The Free Encyclopedia, 22 Mar. 2018. Web. 9 Sep. 2018. Cultivation and Propagation: Conophytum wittebergense is easy to grow, but like most, it will split and crack if overwatered (unsightly but usually not fatal). These plants grow on winter rain and head for summer dormancy. More or less dormant in summer. Soil: They prefer a very porous potting mix to increase drainage. You can grow a plant in a 6-8 cm pot for years and have perfectly happy plants. For best results, use a shallow pot. Watering: It requires little water; otherwise its epidermis breaks (resulting in unsightly scars). Water throughout the year although minimally in summer, (only when the plant starts shrivelling), but it will generally grow even in summer if given water. Water regularly in winter after the previous year's leaves have dried up. Requires good drainage. Propagation: It can be reproduced both by cuttings and seeds. Take the cutting from a grown-up mother plant. Each cutting must contain one or more heads, along with a fraction of root.